Waite, P.B. et al. "Fathers of Confederation". The Canadian Encyclopedia, 24 January 2018, Historica Canada. https://www.thecanadianencyclopedia.ca/en/article/fathers-of-confederation. Accessed 21 April 2019. 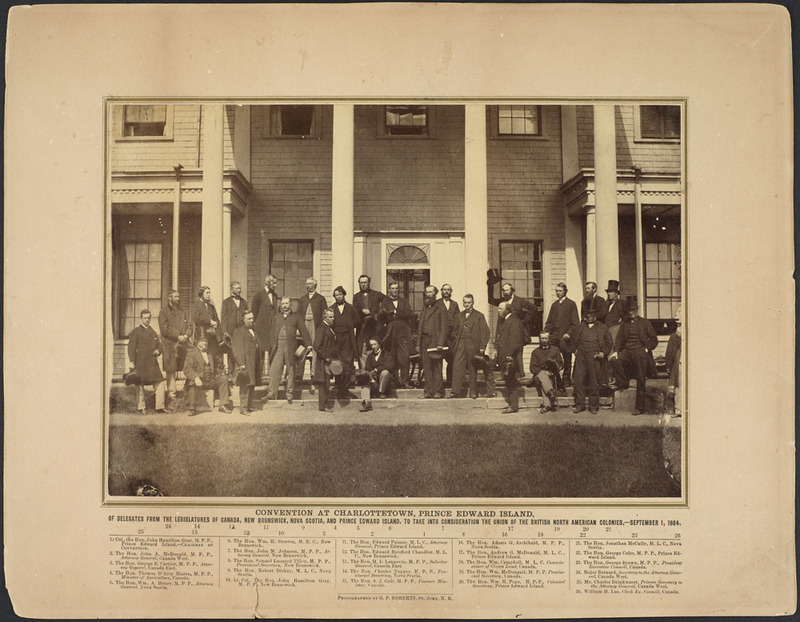 Notably, several delegates attended only one or two of the conferences, while the representatives from Prince Edward Island and Newfoundland ultimately declined to support Confederation. Beyond these original 36 men, the subject of who should be included among the Fathers of Confederation has been a matter of some debate. The definition can be expanded to include those who were instrumental in the creation of Manitoba, bringing British Columbia and Newfoundland into Confederation, and the creation of Nunavut. The wives and daughters of the original 36 men have also been described as the Mothers of Confederation for their role in the social gatherings that were a vital part of the Charlottetown, Québec and London Conferences. Although Sir John A. Macdonald is commonly viewed as the chief architect of Confederation, academics, journalists and heritage bodies have argued for the prominence of other figures such as George Brown and Sir George-Étienne Cartier. The Charlottetown Conference (1–9 September 1864) was intended to be a discussion concerning a possible union of the Maritime colonies. After representatives from the Province of Canada requested to be included, the discussion expanded to include a potential union of all of British North America. Newfoundland was invited to take part, but its invitation arrived too late for the colony to organize a delegation. The conference was noteworthy for the lavish banquets and balls that accompanied the actual discussions. At the close of the proceedings, the delegates agreed in principle to the proposed union presented by representatives from the Province of Canada and scheduled another conference the following month in Québec City. 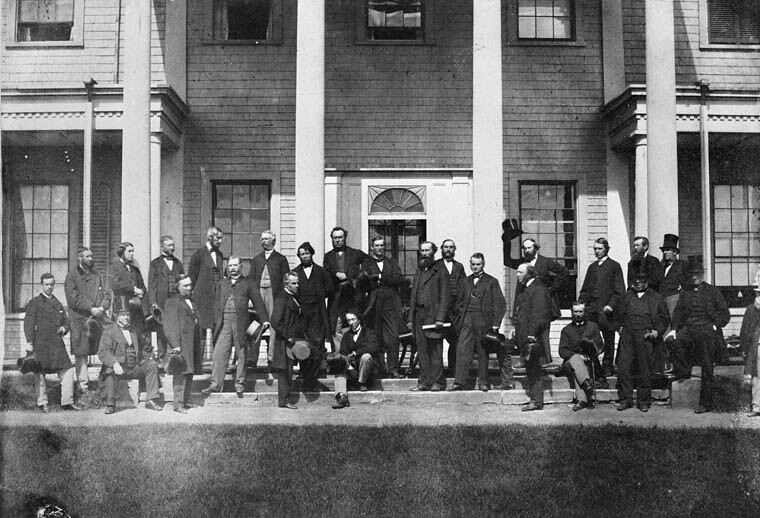 At the Québec Conference (10–27 October 1864), delegates, including representatives from Newfoundland this time, discussed the specific details of the broad proposal that was agreed upon at Charlottetown. The result was the 72 Resolutions, which formed the basis of the Canadian Constitution. After Prince Edward Island and Newfoundland rejected the resolutions, Nova Scotia, New Brunswick, and the Province of Canada were the only remaining supporters of union. Delegates from New Brunswick and Nova Scotia, however, faced significant opposition from within their own provinces (see Confederation’s Opponents). At the London Conference (4 December 1866 to February 1867), 16 delegates representing Nova Scotia, New Brunswick and the Province of Canada met in England to draft the British North America Act. The Act, based on the 72 Resolutions established at the Québec Conference, made minor concessions to the Maritime Provinces and made provisions for the future inclusion of Prince Edward Island, Newfoundland, the North-West and British Columbia. Despite the lobbying efforts of Joseph Howe of Nova Scotia, who headed an anti-union delegation (see Confederation’s Opponents), the British North America Act easily passed through British Parliament and was signed into law by Queen Victoria on 29 March 1867. Louis Riel, the leader of the Red River Resistance, is often cited as Manitoba’s Father of Confederation. In 1869, the Canadian government negotiated an agreement to purchase Rupert’s Land from the Hudson’s Bay Company. Métis of the Red River Colony, who were not consulted in the agreement, worried that their rights would be ignored in the transfer. Under the leadership of Louis Riel, Métis seized control of the Upper Fort Garry trading post, declared a provisional government and sent delegates to Ottawa to negotiate the Red River Colony’s entry into Confederation. The Canadian government was forced to give in to Métis demands. In May 1870, the new province of Manitoba was created through the Manitoba Act. This act also granted Métis title to their lands along the Red and Assiniboine rivers with another 1.4 million acres for their descendants and guaranteed French and Catholic linguistic and religious rights. Despite this victory, Louis Riel was denied amnesty for leading an uprising against the Canadian government and forced to flee to the United States. The figure most associated with British Columbia’s entry into Confederation is Amor de Cosmos. As a member of the Legislative Council of British Columbia, he introduced a resolution as early as March 1867 calling for the province’s inclusion in Confederation. In May 1868, de Cosmos helped to found the Confederation League, whose goal was to raise public support for union with Canada. In 1870, he took part in the “Great Confederation Debates,” which resulted in the Legislative Council voting to send a delegation to Ottawa to negotiate the province’s entry into Confederation. Crippled by debt, Newfoundland accepted the establishment of a commission government on 16 February 1934 to help in its economic reorganization. The government was structured with a governor at its head who acted on the advice of six commissioners appointed by the British government. After the Second World War reinvigorated the local economy, Newfoundlanders were prompted to appeal for the re-establishment of responsible government. The British government formed the National Convention in 1946, which included 45 elected delegates from across Newfoundland and Labrador, to study the forms of government that would replace the commission. Two main factions emerged: those who advocated for responsible government, led by Peter Cashin; and those who wanted union with Canada, led by Joseph “Joey” Smallwood. The convention scheduled a referendum on Newfoundland’s political future for 3 June 1948. Vigorous campaigning ensued between the Confederate Association, the Responsible Government League and the Economic Union Party (which supported annexation by the United States). The results of the first referendum were inconclusive, as the responsible government group won but did not receive a clear majority. Supporters of union with Canada won the second referendum held on 22 July 1948 with 78,323 votes (52.3 per cent) over 71,334 votes (47.7 per cent) for responsible government. An amendment to the British North America Act (referred to as the Newfoundland Act) finalized the arrangements. As a vigorous campaigner for confederation, Smallwood, dubbed the “last Father of Confederation,” became the leader of the provincial Liberal Party and served as premier of Newfoundland and Labrador until 1972. Canada's Inuit communities made their case for self-governance in the Eastern Arctic in the 1970s following cases made by Nisga’a in Northwest British Columbia, the Innu and Cree of Québec, and Dene in the Western Arctic (see Aboriginal Land Claims). With the help of the Inuit Tapirisat of Canada (ITC) — an organizing committee of Inuit founded in 1971 by Tagak Curley — the Inuit community submitted its first land claims proposal to the Government of Canada in 1976. The plan was later withdrawn owing to a lack of community input and the complexity of the provisions put forth. The Northwest Territories Inuit Land Claims Commission (ILCC) submitted a simplified version in 1977, but discussions stalled. The group subsequently disbanded and was replaced by the Nunavut Land Claims Project (NLCP). In 1979, the ITC drafted a claim that blended provisions from earlier claims, including the division of the Northwest Territories. A majority of voters (56 per cent) supported the proposal in a plebiscite held in 1982. The Tungavik Federation of Nunavut was formed and took over duties from the NLCP in negotiating the land claims. The Nunavut Land Claims Agreement was signed in September 1992 and passed a plebiscite with an overwhelming majority of 84.7 per cent. The Nunavut Act was passed on 10 January 1993 with an implementation deadline of 1 April 1999, at which time Nunavut, or “Our Land” in Inuktitut, became Canada’s third territory. In the interim, John Amagoalik, president of the ITC, was appointed chief commissioner of the Nunavut Implementation Commission. An election for Nunavut’s Legislative Assembly was held 15 February 1999, which saw the election of Paul Okalik as the territory’s first premier and Helen Maksagak appointed as the first commissioner of Nunavut. Scholars have noted the absence of women in accounts of the events that led to the founding of Canada. However, the wives and daughters of politicians who gathered in 1864 participated in the social events that surrounded discussions. They were, as one commentator notes, “allies in building the nation.” It is also through the sources these women have left behind — letters (Anne Nelson Brown), diaries (Mercy Coles), biographies (Lady Agnes Macdonald) — that we gain added perspective on how decisions were made. These women are collectively known as “Mothers of Confederation,” and efforts are being made to integrate their experiences in the narrative. The case for George Brown as Confederation’s true fatherAn article about politician George Brown’s role in crafting the framework for Canadian Confederation. From the Globe and Mail. Fathers of ConfederationSee profiles and photographs of Canada’s Fathers of Confederation. Click on the links for more information. From the Government of Canada website. The Critical Years: The Union of British North America 1857-1873A review of W. L. Morton’s book that summarizes the many tradeoffs and compromises that convinced the colonies to accept the terms of Canadian Confederation. From canlit.ca. The Evolution of the British North America ActA question and answer discussion about essential terms of the Constitution Act of 1867 (British North America Act). From the University of Toronto website.